"Company and engineer (Tim) highly recommended." "Excellent company. Kept me informed every step of the way, good price, polite engineer. Very professional." "Have been a customer for 20+ years. Would not use anyone else." "Very good, tidy work, very clear on how to work alarm etc. Very friendly and good at installing alarm system"
"Very good from start to finish." "Very efficient and polite service. Very clean work and no mess." "Richard did a great job and was very easy to talk to. His work was neat, he kept to the job specification, confirmed with me that it was what I wanted before starting, explained what he was doing and answered any questions that I had. I'm very pleased that I chose Mercury to do this work, all my contacts with the company have been extremely positive and I'm very happy to recommend them." "This company provided a fantastic service. 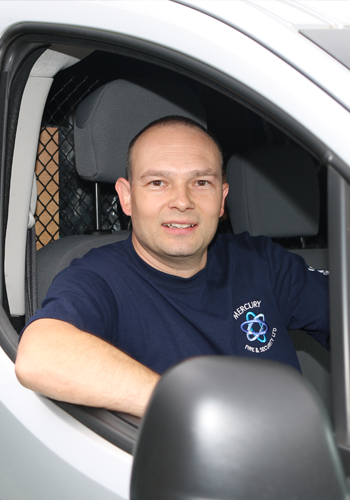 There installer, NIGEL, was thoroughly clean and tidy throughout his work. I didn't perceive any pressure whatsoever from there sales agent, Ashley. I would not hesitate to highly recommend Mercury to anyone considering a home alarm or CCTV. DON'T delay get on with it and employ Mercury. Many people believe they are competent enough to fit their own alarm / CCTV but DON'T realise they may be invalidating their insurance policy simply because they MUST ensure the work is installed by a certified electrician. I'm having Em back soon for my CCTV. "Been with mercury for 4 years now and the service is always top notch. Friendly engineers who are always on time and complete the job efficiently. Highly recommended." "Mercury have carried out an annual service at one of our rental properties for some years now and I always find them to be very helpful, with all work being carried out in a timely fashion and to a very good standard." "Keith has serviced our system today. It is his 3rd annual visit. He is always prompt, polite and pleasant." "A big thank-you to you and your installation team. The upgrade to our CCTV system here at Greasley Sports Centre has been a major success. As always, your team worked in a clean, tidy and diligent manner. The CCTV has proved useful already in a couple of instances where we have had to refer to the recordings. I would also like to compliment you on your fast response time in relation to repairing two damaged cameras recently. I would have no hesitation in recommending your company to any potential customer." "My alarm was fitted by Mercury Fire and Security over 13 years ago , I have always found their service to be punctual, friendly and professional." "We would like to thank Mercury for their professional, friendly and prompt service." "Good installation and all working as expected." "Very good, tidy work, very clear on how to work alarm etc. Very friendly and good at installing alarm system." "This is the second complete intruder alarm Mercury have installed for me in the last six months ( two properties ). I think that says it all!!! Excellent!" "Excellent service in all areas. Thoroughly recommend this company." "Very happy with the work and the staff very helpful and understanding." "Mercury Fire were good at feedback in relation to our insurance specification." "Professional, courteous, punctual and flexible. Kind, decent people providing a good service as required." "We have used Mercury Fire & Security for a number of years now and the company has always proved to be very professional but they have excelled this time, we are having a new bathroom fitted and we forgot to have the alarm box moved !! Following a quick phone call they came out within 1 hour and moved the box to allow the bathroom fitter to continue his work. Excellent service and therefore would highly recommend this company." "Good to be able to use email rather than paper for arranging annual maintenance visits." "Provided a professional service, responded to my needs without any issues. A qualified and experienced Engineer fitted the camera into my current system without any problems." "We had an alarm system installed by another company and regretted it since day one. Ashley and Mercury came and fixed all of our problems simply and efficiently. The service level was brilliant and the system works like a dream now. Craig the installer was thoroughly professional and Ashley designed an easy to use and functional alarm system. A big thank you and most appreciative of the high level of service offered. James and Lavinia." "Staff friendly and helpful. Able to rearrange their diary to accommodate my requirement. Much appreciated." "The engineer was efficient and polite I would recommend this firm"
"We have used Mercury Fire & Security for a number of years. The company has always proved Genuine, Punctual and Professional. Would highly recommend this company." "Exceptional service, the engineer did what he had to, was polite and courteous. He knew his stuff. Would recommend to anyone"
"Superb service from start to finish. Professional, courteous and customer focused. I would have no hesitation in recommending Mercury to any of my friends." "Professional job. I would recommend this company." "Very good service and polite staff, professional through and thorough." "Thank you for arranging the necessary appointment for a replacement camera to be fitted to my house, and for that to be done under warranty. I am pleased to inform you that the new camera is doing the job just fine and the colour distortion has now ceased and the image is viewed clearly in black and white ( at night), and assuming it stays that way, I would say job done! The engineer who visited was certainly a great representative for Mercury and did the job swiftly and without any problem. Thanks again for everything." "Impressed by thoroughly professional service." "As ever cannot fault service from "Kevin" engineer thank you from Peter Lane Director"
"Thank you Mercury Fire for looking after the fire and security needs of the Vine so well. So security cameras are working fabulously, and the picture quality is amazing." "So security cameras are working fabulously, and the picture quality is amazing." " I always find them to be very helpful, with all work being carried out on time and to a very good standard." "Now that everything is complete with our installation, I should like to express on behalf of our sincere gratitude and appreciation for your expertise and your kind consideration to us at a time when things were very difficult after the break-ins. We could not have asked for better service than we received from your company, and your friendly assistance at every stage of the process has been much appreciated."